A nabob /ËˆneÉªbÉ’b/ is an Anglo-Indian term for a conspicuously wealthy man who made his fortune in the Orient, especially in the Indian subcontinent. Nob is also a disparaging British slang abbreviation of "noble/nobility" referring to the monied, often titled upper-classes. Nob Hill is one of San Francisco's signature neighborhoods centered on the intersection of California and Powell Streets. Originally called California Hill prior to the 1850s, it was renamed Nob Hill after the Central Pacific Railroad's Big Four, Charles Crocker, Leland Stanford, Mark Hopkins and Collis Huntington, nicknamed the Nobs, built their mansions there. Today, luxury hotels now stand in the place of those original palaces, among them the Fairmont, the Mark Hopkins, the Stanford Court, and the Huntington Hotel. 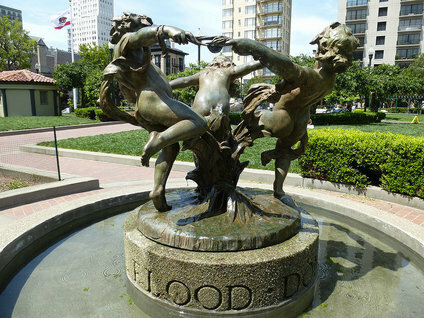 Other noteworthy Nob Hill landmarks include Flood Mansion, now home to the exclusive Pacific-Union Club, Huntington Park with its centerpiece fountain, a copy of Rome’s Fontana delle Tartarughe (Fountain of the Turtles) by Taddeo Landini (1585), and Grace Cathedral, the largest Gothic structure in the West.